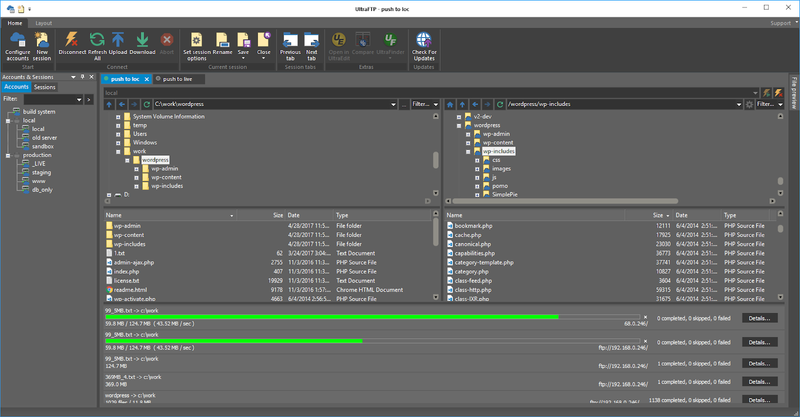 UltraFTP is a personal, stand-alone FTP client built upon the framework of other IDM applications like UltraEdit and UltraCompare. Designed with maximum usability and performance in mind, UltraFTP offers full theme support, session support, an explorer interface, drag-and-drop transfers, and more. Even better, UltraFTP integrates with UltraEdit/UEStudio, UltraCompare, and UltraFinder to provide a seamless editing and publishing experience both on local and remote systems. UltraFTP supports FTP, SFTP, and FTPS protocols. Need support, have a feature request, want to see specific support for a special use case? That's what IDM is known for. We have a user community millions-strong and any product we make comes from your and their requests. Let's talk security. If the work you do is important, mission critical, or the means in which you support your family or core business, then consider a commercially supported solution. Our investment in security is only second to the investment in our team. We have a hardened facility, in house developers, a brilliant cloud infrastructure all geared towards pure computing security. No plugins. No unsigned libraries. No excuses. No kidding around with what we put on your hard drive.